FANS BACK HOME erupted in celebration and the beer went flying as England reached the World Cup semi-finals for the first time in 28 years on Saturday. At Flat Iron Square in London, where 650 people crammed in to watch on a giant screen, the party began with beer showers and chants of ‘Football’s coming home’ after the 2-0 win over Sweden in Russia. Friends leapt on one another’s shoulders to belt out the song from the 1996 European Championships, an uplifting Brit-pop anthem of maintaining hope against precedent. “I’ve been going thirsty to the well of pain for a long time,” said long-suffering fan Stephen Walter, 42, from north London. “We could actually win this. This is exactly what the country needs. I absolutely believe we will be world champions. The last time England reached a World Cup semi-final was at Italy 1990, when 16 of the current squad were not even born. Margaret Thatcher was Britain’s prime minister. Phones were coin-operated, came in red boxes and people queued to use them. The 1990 squad starred Gary Lineker, John Barnes, Chris Waddle and Paul Gascoigne. Peter Shilton, England’s goalkeeper then, is now 68. In Flat Iron Square, in scenes mirrored across the country, many had the England flag — Saint George’s red cross on white — painted on their cheeks, and while many men wore replica England shirts, many more stripped off in the baking 30-degree heat. An air horn went off to cheers at the first appearance of the teams in the tunnel and ‘God Save The Queen’ was belted out in a full-throated rendition. A tight first quarter quietened the mood but the place erupted in the 30th minute when Harry Maguire headed in England’s opening goal with beer flying everywhere, gallons raining down as people roared in celebration. She did not have to wait long for the next dousing when Dele Alli doubled England’s lead and the drinks went flying once again, people clambering on the tables as they bounced around in delight. The goal triggered chants of ‘I’m England till I die’ and as full-time approached, any nervousness evaporated and the party could really begin. At the final whistle, people bounced erupted in wild jubilation once again, with beer, clothes, barriers and bodies tumbling to another deafening chorus of ‘Football’s coming home!’ as flares went off and passing truck drivers honked their horns. “I’ve never seen us so good. This is something different. The whole nation is going crazy. It’s chaos. I’ve never been so soaked in beer!” said south Londoner Tony, who turns 28 on Sunday. Adam Clayton, 38, wearing a replica of Gascoigne’s 19 shirt from the 1990 World Cup, recalled the long wait to let rip. “Words can’t describe it. It’s insane. I think it is actually coming home! I seriously believe so! Many a tear. We’ve had a nice run of the draw, which is right for England after the terrible times we’ve had,” the Arsenal fan said. Email “'We could win this' - Beers and cheers as England fans go wild over World Cup win”. 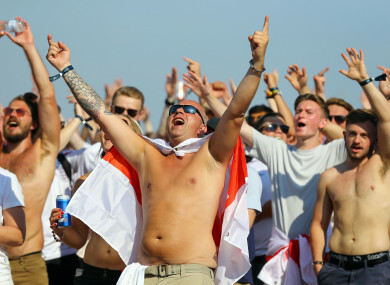 Feedback on “'We could win this' - Beers and cheers as England fans go wild over World Cup win”.